Charcot foot is a condition that can usually occur in patients with severe nerve damage (neuropathy) of their feet and changes in blood flow causing weakening of the bones. With continued walking, these bones may fracture and cause the foot to change its shape, even collapse in the arch area. Charcot foot can lead to significant disability and even amputation if not diagnosed and treated appropriately. Diabetic patients are usually predisposed to neuropathy, and this often predisposes them to Charcot foot. Decreased sensation may make the patient somewhat unaware of this condition, and he/she may continue to walk, thus making the injury worse. Preventative measures are the key to slowing or even halting progression of this condition. The symptoms of Charcot foot usually include redness, swelling, warmth of the foot, and sometimes even pain. Early diagnosis of Charcot foot is very important for successful treatment. To arrive at a diagnosis, the surgeon will examine the foot and ankle and ask about events that may have occurred prior to the symptoms. X-rays and other imaging studies and tests may be ordered. Conservative treatment usually consists of immobilization, bracing, custom shoes and activity modification. Keeping blood sugar levels under control can help reduce the progression of nerve damage. Get regular check-ups from a podiatrist. Check both feet every day—and see a foot doctor immediately if you notice signs of Charcot foot. 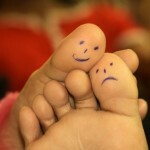 Following your podiatrist’s recommendations for foot care.